All our partner sites are independently reviewed by our team of industry experts. We examine 10 different criteria and award a score out of 10 for each, adding up to a final mark out of 100. You can read a full description of our BGT Games review process here. VideoSlots Casino received a score of 88/100. 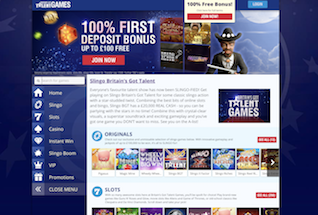 Britain’s Got Talent is the second Freemantle TV brand to be licensed to Slingo-owners, Gaming Realms, to create a games site for Slingo and Slots lovers. The X Factor games is already a huge success, and here another of Simon Cowell’s creations gets the casino treatment. The Britain’s Got Talent TV show began in the UK in summer 2007 and has delivered fun, hilarity and on occasion, genuine talent, every year since then. The latest series (2017) was won by a male pianist, Tokio Myers. ITV have signed a contract to continue the show until at least 2019. So how does it work as a casino? 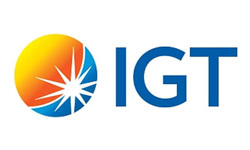 Well, BGT Games delivers glitz and glamour in abundance, with all your favourite Slingo formats, and a wide variety of slots from top providers like IGT and NetEnt. There are also regular table games and instant wins with jackpots of up to £150,000. 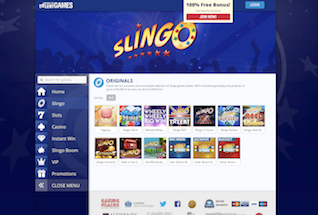 And just like the X Factor Games, Gaming Realms studio has created a version of Slingo to go with the site – BGT Slingo – with a £20,000 jackpot. Like its sister sites from the Slingo network, BGT games is built with mobile play in mind – it looks great on all handheld devices and offers payment by mobile phone through the Skrill cashier option. BGT Games operates under licenses held by Gaming Realms subsidiary, The Bear Group Ltd, from Alderney and the UK. There is no current welcome promotion at BGT games – keep checking back for a new offer coming soon. New players at BGT games will receive a very simple sign up offer of 100% up to £100 to welcome them to the site. The offer starts on a minimum deposit of £10 and is valid up to a maximum bonus of £100. There are wagering requirements on the bonus money, which will be credited immediately. The requirements are 80x on slots, 60x on slingo and 8x on bingo-format, Slingo Boom. Winnings from your welcome bonus are restricted to £500 and are credited as cash only once you have met the wagering requirements of the offer. The wide selection of Slingo and Slots games available at X Factor Games, Spin Genie and Pocket Fruity is also available at BGT Games. So, dip into BGT Slingo, Slingo Riches, Slingo Extreme and the recently released Slingo Rainbow Riches which marries Slingo with a truly classic video slot brand. From the Gaming Realms studio there are also new games like Pigasus – a 5 Reel and 20 Payline slot with Free Spins and Multipliers – Wheely Wheely Big Win – a spinning wheel game like a simplified Roulette – and Candy-Crush type game, Magic Mine. vFor fans of slots, Gaming Realms have teamed up with some of the best games studios around to bring a wide and varied selection. 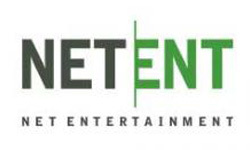 Everyone’s favourites, NetEnt’s games are here. These awesome slots are packed with superb features, plenty of Free Spins rounds, Multipliers and Wilds. 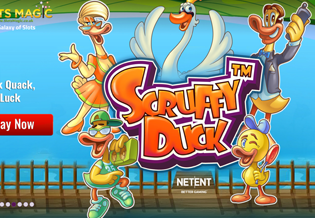 So take your pick from Starburst, Gonzo’s Quest, Twin Spin, new games like Bloodsuckers II, Scruffy Duck and Hanzel and Gretel Fairytale Legends. 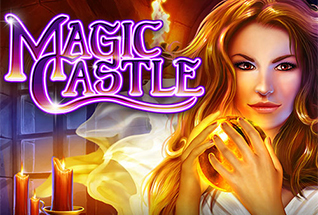 Also on the BGT games list are video slots from Microgaming – Beatiful Bones, Sugar Parade and Goldwyn’s Fairies – and IGT – Magic Castle, Ghostbusters Triple Slime and Get Clucky, amongst many others. And there are plenty of cool instant win games for those who prefer scratchcards, Keno and single-player bingo. Gaming Realms do not offer a Live Dealer suite to their players. Instead, here we get a solid, if modest, collection of table games that includes Blackjack, Roulette, Texas Hold Em single player and a few Video Poker titles. There is a good selection of rewards for players at BGT games and they usually come in the format of free spins, deposit match bonuses and cash drops. In order to ensure you are kept fully up to date on the latest promotions, make sure that you have entered your contact details, including email and mobile phone, correctly when you sign up. This will see that you never miss out on BGT bonuses. The simple layout of BGT games makes it easy to find your way around. The key functions are all within easy reach of the home page – just one or two clicks away. So that means cashier and account, customers service, and of course the games, are quick to find. In short, the site is a pleasure to use. There can be no question that Gaming Realms are strong contenders in the UK mobile casino market. All their sites – Slingo.com, SpinGenie, Pocket Fruity – are perfectly set to make playing on whatever handheld device you own, fun and easy. And BGT Games is no exception to this rule. So, enjoy the site wherever you are, on the go, and even deposit and withdraw cash through mobile payment mechanism, Skrill. Customers of this site can deposit and withdraw through standard debit and credit card payment methods, Visa, Mastercard and Maestro. There are also eWallets and online payment systems like Neteller, as well as mobile option, Skrill. Withdrawals will take up to 48 hours to process during which time they can be reversed into your BGT games account. The customer support team are available between 8am and 11pm daily and can be contacted by Live Chat, Phone and Email. The BGT Games site is licensed by the Alderney Gambling Control Commission and the UK Gambling Commission, ensuring that the site adheres to strict guidelines and mandatory regulations on security, trust and fairness in all gameplay and financial transactions.